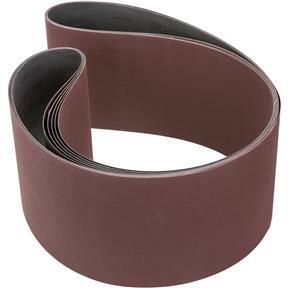 6" x 79" A/O Sanding Belt 220 Grit, 5 pk. Grizzly T28978 - 6" x 79" A/O Sanding Belt 220 Grit, 5 pk. For cleaning, finishing, blending and deburring applications. Belts are made from Low Stretch material for reliable dimension holding – no stretching. For stationary machines.Belts provide a linear grain scratch pattern for blending stainless welds. Blends and finishes without undercutting or gouging work pieces.